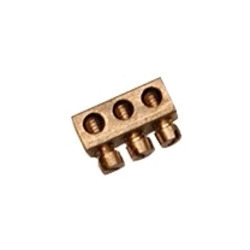 We are dedicatedly engaged in manufacturing and supplying a commendable range of Brass Connector Terminal. Extensively used in building wiring for the distribution of electricity. We “Conasth Enterprise”, are renowned and notable Manufacturer and Supplier of a wide range of Brass Components, Brass Electrical Connectors, Brass Connector Terminals, Brass Inserts, Brass Screws, Brass Pins, Brass Electrical Component, etc. Founded in the year 2000, we are a Sole Proprietorship Enterprise, that is incorporated with an objective of providing the best class brass products to several industries. Located at Jamnagar (Gujarat, India), we have developed an ultramodern and well functional infrastructural unit. Under the supervision of our Proprietor “Mr. Hemant Kateshia”, we have gained huge clientèle across the nation.